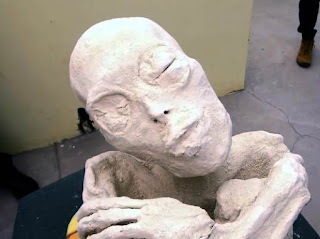 Further weaved is the mythos of the alleged Naczca alien mummy by none other than sensationalist Linda Moulton Howe. Just as Howe did with the bogus Roswell UFO metal, she spins a tale connecting ancient history, geography, the Nazca lines, alien hybrids, and more with a splash of nonsense and sensationalism. This time DNA testing alleged to have been conducted showing that the mummy is 95% primate and 5% unknown, there is a mysterious friction ridge pattern on the mummy fingers, and...wait for it...a secret location with more mummies and artifacts! You can read the series at Howe's website. Howe's latest article series has to do with Steve Mara of Phenomena Magazine. Mara claims to have traveled to a place holding other alien mummies, but does not know the location because he was taken there in secret - but he was shown photographs of a tomb with alien hieroglyphics. The apparent lack of a visible naval or breasts on the mummy prompted Howe to say during her interview with Mara, "Steve, you said there was no apparent naval. That would suggest that Maria (the so-called Nazca mummy) is some kind of android." Howe also posts a photo showing two fingers from the mummy with dermal ridges (aka friction ridges), and claims the ridges are straight thus making this somehow all the more mysterious. It doesn't. 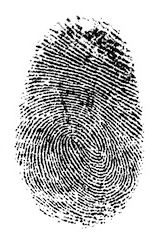 Howe tries to stretch this out by showing a drawing only showing three basic types of fingerprint patterns when there are actually nine type variations including some where friction ridges can appear to be straight. 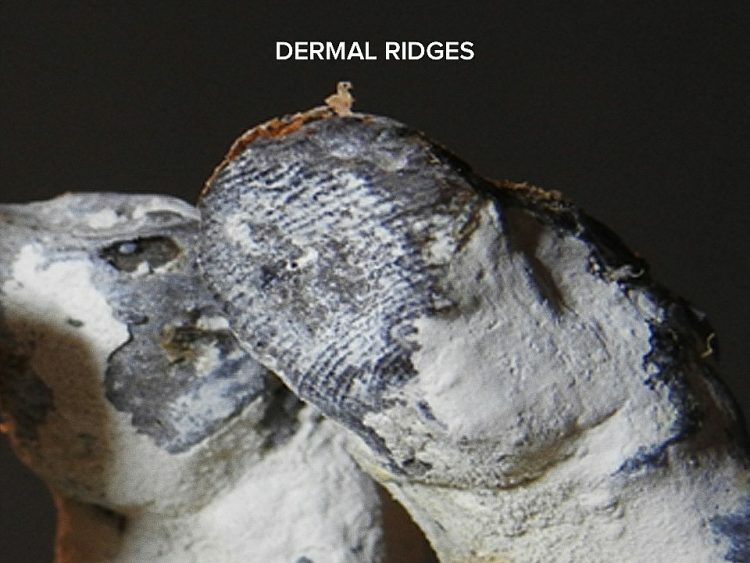 Above: Photo showing two fingers of mummy as appearing on Earthfiles.com. Photo used for comparison and critique. The photo becomes useless for any sort of analysis because there is no photomacrographic scale in the photo to determine the actual size of the fingers and ridge area. The other problem is that the photo was taken with the fingers at an angle, does not indicate if this is the right or left hand, and does not accurately reflect the curvature of the surface or friction ridges. On the finger in the foreground of the mummy, you can see as you look lower that the friction ridges do indeed begin to curve and are not all straight as Howe claims. You can also see the finger in the background has curving friction ridges, not straight ridges as Howe claims. The other thing one needs to take into account is that the skin is dehydrated and this will cause the friction ridges to lose shape. The photo below demonstrates what is known as postmortem skin slippage. 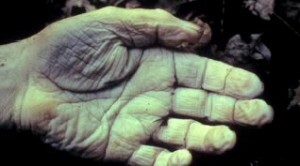 Note the fingertips where there appear to be indentations, dimpling, or shriveling of the skin. While not as apparent as in the photo below, this effect is evident on the fingers in the mummy photo above. When slippage or dehydration of the fingertips occurs postmortem, the friction ridges will lose their original shape including curvature. In obtaining prints from a deceased subject, one method involves injecting liquid into the hands to help plump the hands up to as close to their original shape as possible. The following friction ridge impression from a human finger shows flat line dermal ridges. As with the mummy finger photo, we are only seeing part of the print and the image has been angled. Below is the original print prior to being rotated. While this may only be a 2D representation of a print, I think it demonstrates how a simple angle can impact how something is represented. And, yes, human prints can also have straight friction ridges. Combine the angle of the photo, no scale for measurement, the effects on the skin postmortem, and what we have is speculation, not proof. More speculation comes from Howe asking if the mummy could be an "alien hybird" and goes on in the second part of the article series to suggest that some dimpling found on the skin of the mummy might be reptilian. Howe doesn't use that particular word, but it is clear what she implies in the article. Howe then delves into Greek mythology about a hybrid snake/human god called Glykon. But Howe doesn't stop her inference there, she throws in Babylonian demons and comes full circle about EBE's and aliens having allegedly altered human evolution by manipulating DNA. 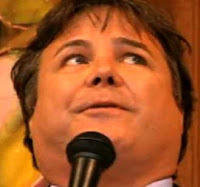 Howe's interview of Mara includes him talking about those in possession of the mummy putting an asking price of $1,000,000 on the mummy and subsequently asking for $20,000 for other mummies in their possession. 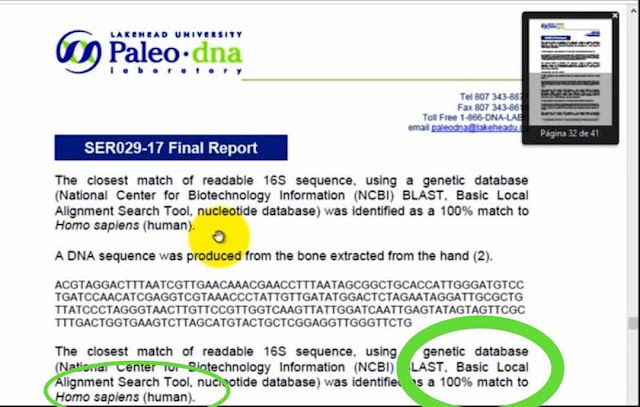 Looks like Mara is no longer in touch with the lab that did this latest claimed DNA work since he won't fork up $15,000 for continued testing and Maria the mummy has also vanished. The mere fact that grave robbing and cobbling together fake mummies from body parts and plastering them is noting new in Peru and what appears to be some shady grave robbers asking for big bucks, I don't think it takes much to put this all together as a scam. Speculation and sensationalism do not equate to science, but don't tell Linda Howe that. 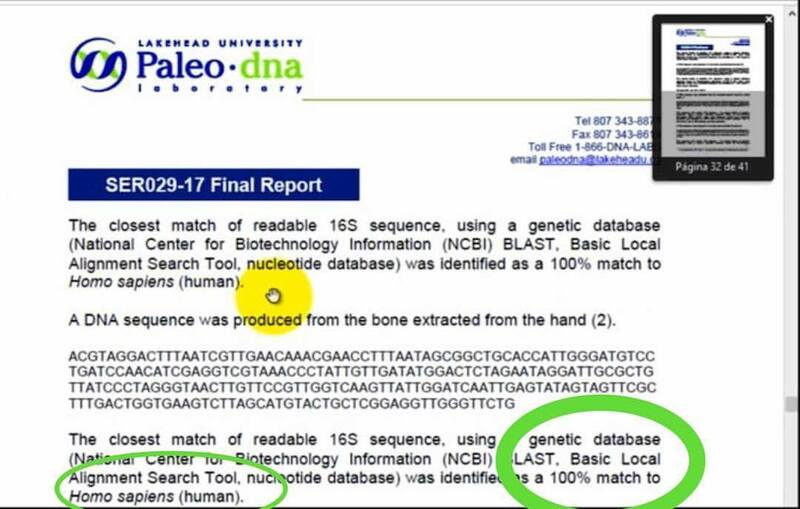 Let's be clear that the DNA test commissioned by Gaia.com came back and showed the mummy was 100% human. In usual Howe fashion, she fails to mention the below report. Linda Howe also fails to disclose in the article on her website promoting the mummy that she is the host of a show on Gaia.com's subscription service called (ironically) Truth Hunter. So far what there is evidence of is nothing more than sensationalism, speculation, and a poor attempt at tying in the alien mythos at every turn by throwing out UFO hot button words. 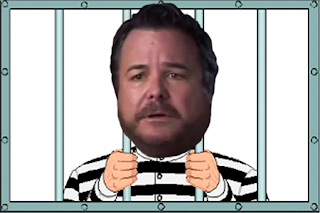 This is where we hit the wall with these cases where UFO sensationalists, entrepreneurs, frauds, and hoaxers all come out to play but do not provide any solid, verifiable evidence. I am pretty sure Linda Molton Howe is some kind of alien. That face... yeesh.